Patients with rectal cancer often have to undergo long periods of chemotherapy and radiotherapy to shrink the tumour before surgery. This can leave the body weak and vulnerable, reducing the chances of a quick and successful recovery. 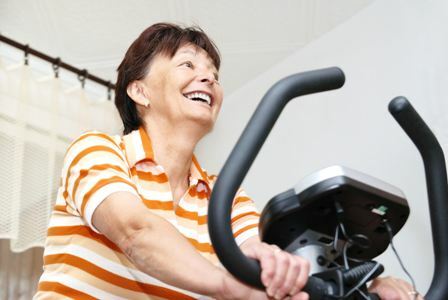 In a new pilot study, in collaboration with Aintree University Hospital and the University of Southampton, patients are entered into an exercise regime on bikes following treatment, while they wait for their surgery date. The programme runs three times a week for six weeks, and is aimed at improving fitness levels and quality of life, as well as reducing stress levels before a major operation. Malcolm West, researcher at the University’s Institute of Ageing and Chronic Disease and surgical registrar at Aintree University Hospital, explains: “After many weeks of chemoradiotherapy, which can be physically and emotionally taxing, a patient may spend a long period of time sat at home simply waiting, and worrying, about the next stage of their treatment. “Chemotherapy and radiotherapy can impact on muscle mass, acting on the cells that generate energy. We are working to reverse this decline and improve patients’ fitness levels and ability to sustain surgery. “Routine exercise in between treatment and surgery should give patients a fighting start ahead of surgery. We have already seen some very positive results from the patients currently enrolled in the trial. The pilot scheme is funded by the National Institute for Health Research (NIHR).